Email: Click this link to send us an email. When registering on our site, as appropriate, you may be asked to enter your name, email address, mailing address, phone number or other details to help you with your experience. 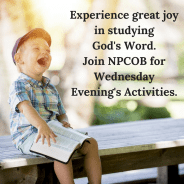 We use the information we collect from you when you register for Awana, Vacation Bible School or complete an enrollment form for the Good Neighbor Nursery School. We do not use an SSL certificate because we do not collect financial information. We do not sell or trade your Personally Identifiable Information. Jotform collects your information when you complete a registration or enrollment form for Awana, Vacation Bible School and or the Good Neighbor Nursery. The information is then given to us for internal use only. We have not enabled Google AdSense or Google Anaylics. It's also important to note that we do not allow third-party behavioral tracking. We do not market to and collect information from children under 13. Parents are to complete the registration and or enrollment forms themselves and not their children. • We will not require a parent to disclose more information about their child than is reasonably necessary to participate in an activity. • Parents can review their child's personal information, direct us to delete it, and refuse to allow any further collection or use of the child's information. • Parents can agree to the collection and use of their child's information, but still not allow disclosure to third-parties unless that's part of the service. • Parents can review, delete, manage or refuse with whom their child's information is shared through emailing our staff or through calling the church office. • Parents can give consent by electronically signing a registration or enrollment form and send it back to you via electronic scan or contacting us directly. • Include the physical address of our church. npcob@bnin.net and we will promptly remove you from ALL correspondence.